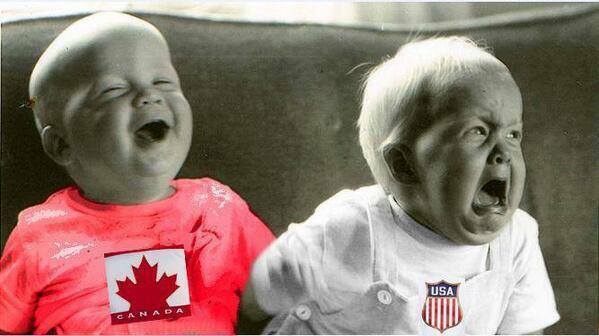 The second kid looks like Phil Kessel. My god... Canada's Defence... I was right all along. The moment this game went full on north south.. you can see the USA defence crumble as the game went on. Eventually line up the red wall to force the US skaters to play chase was the worst thing to happen to team USA. Last edited by Tim Budong; 02-21-2014 at 08:44 PM. bring your own beer to the pub? I felt that the majority of our defense was a solid offence but when we did have to play in our zone, it was gritty and effective. A few US opportunities here and there but that's what Price is for. The combination of size, speed, skill, attitude and coaching was awesome. Absolutely amazing to watch the 2 best teams play a chess match, offence vs. defense, great coach vs. great coach, then add in the history involved = epic. No all stars, no MVP's, just the best players with a common goal. Keith got burned 4 times by my count. Twice by Kessel on his left side. Just looked slow. He's having a rough olympics. I don't know how liquor laws work at casino's but I've bought drinks at 3/4am. Might just end up catching the game at Boulevard in Coquitlam. RS meet? they shouldn't be serving at that time. I think 2am is the cut off for most places. NBC Olympic Primetime, yuno show hockey highlights? I have played poker into the early morning many many times and they have a cut off just like bars do. ^ ah ok. Thanks. Yeah, I just remember being able to buy a few drinks there once at around 3 am but that was many many years ago. This. He made up for it on a number of backchecks. But I was shocked at who's arguably the fastest D-man on the planet getting just plain beat from the outside. I mean Kessel is fast, but Keith shouldn't be that stupid to not angle him off. NBC has the worst Olympic coverage ever. A lot of players have gotten sick in Russia, could be illness. May also have a minor groin injury or something. He definitely was slower than he usually is. Had breaky, walked around the neighbourhood, took shower, watching the Americans get beat by Selanne, LOL. I used to make fun of my father waking up early. Now that I'm old, I get up at 5 am without fail. Anyway.......... Rask is doing what he does best. Holy carp, the Finns were all over the US after the end of the penalty. Couldn't score. The Finns are playing very physical. Huge hits. Haha..... Kesler saved a goal......... with his face, LOL. The nose, no doubt. I wAnder if Kelly, Backes' wife, is at Sochi.... "Kelly is a great gal." I can now safely turn off TV knowing the Americans have been shutout of medals in mens hockey........... yeah, at least they got their women to get 'er done.